itsAlyx: If It's Still in Your Mind, it's Worth Taking the Risk. 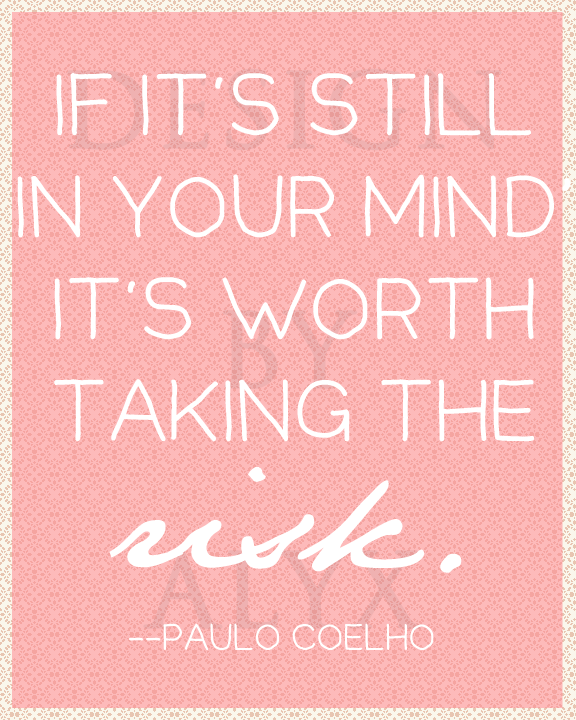 If It's Still in Your Mind, it's Worth Taking the Risk. Kelly had that quote up there (from Paulo Coelho) on her blog the other day, and that puppy just about smacked me in the face. There's something you should know about me - I am the type of person who wants a lot of things for myself. I'm not talking about the latest clothes or shoes, here - I'm talking achievements. I'm also the type of person who will not stop until I accomplish those things, or until I've gotten where I want to be. If I want something, I will work until I get it. If I want to do something, I will do it. If I want to accomplish something, I will accomplish it. Lately, though, I've been a little apprehensive. I've thought a lot about certain things, but have decided for myself that I'm not ready, that it's not worth the risk. Excuse my French here, ladies (and gents), but that attitude is a load of freakin' bull crap. Why do we think like that? How in the world do we know whether or not we are ready for something unless we try? Who are we to decide that something is not worth the risk/effort/work it would take? These things, the ones that I've been thinking about... 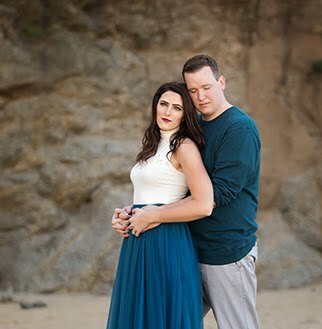 I can't get them out of my mind, no matter how many times I tell myself those things above. It's like they are constantly in the back of my mind, trying to push their way to the forefront of my thoughts, but part of me is shoving them back, yelling at them to get out. That, my friends, is why this quote hit me - because it's true. If you can't get something out of your mind, then go for it. What is the purpose of dreams if we don't chase them? Thank you for this. I needed that push. Yep, been thinking about this a lot lately! But I'm scared! Idk if I should do itttttttt yikes. Career change? Maybe it is time! Doubt is a common theme with me. I needed this quote! Go for it! That's a great quote and a beautiful print. Whatever it is that you want to achieve, go for it and get it girl! Yes!!! I think sometimes we all need that little nudge or slap in the face. Dreams are useless if they just stay dreams. So, so true!!!! It is so ironic that you posted this right now, but I'll have to tell you why it's ironic later. :o) Secrets!! love the quote and love the print you made! i don't know what it is about getting older that makes things start to seem impossible or too risky...but what a great reminder when those thoughts start to overtake us! hope you're doing well lady - keep going because you're AMAZING! I need to print that out, I really need that reminder right now. Such a great quote. I have so much apprehension in my life lately, something about getting older just makes you fear failure more often. I wish I still had the courage of a kid! WOW! This post is like you took the words straight out of my mouth (and I feel like we have a lot in common). I've always been a go-getter, dreamer, and risk taker. It's been my biggest strength/biggest weakness because I've accomplished a lot but I'm always chasing that next dream, or next goal. I've had a lot on my mind lately, ideas of things I'd love to do, but I spend all day thinking abou the what-if's. What if I'm not appreciating where I'm at right now? What about my friends? My family? My career? Every choice involves some sort of risk, and it's hard to weigh them. Good luck and I hope you continue chasing all your dreams! I hear this! I am really persistent when I have an idea in my head. I don't always understand people who are still talking about the same ambitions years on without doing anything about it! My dad would say, "less talk, more action" which is probably one method of stopping me yapping, but I guess this mentality has seen me through quite well. I need to print that quote out, blow it up, and hang it over my bed so I see it first thing, and last thing.